Lucas Fox showcases three of the finest penthouse apartments currently on sale in the most sought-after districts of Madrid. Is there anything more aspirational than buying a penthouse in the heart of one of the world’s most beautiful and vibrant cities? Owning your own penthouse gives you the prestige and a sense of ‘having made it’ not to mention the peace and quiet – penthouses are further from the street noise of course with no neighbours upstairs. You also get unobstructed views, lots of natural light, high ceilings and good distribution. In addition, penthouses often have amenities that the rest of the units in a building may not have, such as private and large outdoor spaces. What’s not to like? With all this in mind, here are our top three penthouses currently for sale with Lucas Fox in Madrid. Occupying the top three floors of a brand new building, this beautiful triplex has been refurbished to fit in perfectly with the historic surroundings of one of Madrid’s most exclusive neighbourhoods. This penthouse is the crowning glory of this exclusive development, with beautiful living spaces and outstanding views from the terraces including a private pool on the 8th floor. The sweeping interiors are flooded with natural light thanks to the contemporary open layout. In addition to their own private space, residents also have access to the finest communal facilities including gardens, gym, spa and a pool designed by contemporary artist Carlos Cruz-Diez. This property is located close to the city’s Triangle of Culture, which includes the Prado, Reina Sofía and Thyssen museums. The best hotels in the city are also here, as well as many restaurants, art galleries and designer shops. Atocha station, with its metro, commuter train, AVE and bus links, provides very easy connections to the whole city. This is a one-of-a-kind property for the truly privileged, bringing the traditional feel and history of a grand, historic apartment up to date and safeguarding a new definition of luxury living for the future. Arguably one of the most spectacular properties currently on the Madrid real estate market, this triplex penthouse boasts two south facing terraces, one on the 7th floor and the other on the rooftop with panoramic views over Madrid. The building has exceptional communal areas: a spacious lobby equipped with 24-hour security, CCTV, storage rooms and parking with electric car charging power and bike storage. The triplex includes four parking spaces and one storage room. Measuring 423.9m² including terraces and communal zones, the living area, kitchen and a bathroom are situated on the lower floor and the bedrooms and bathrooms on the upper floor. There is also a spectacular 69m² roof terrace with a 360º view to the Madrid´s skyscraper. The living areas overlook Calle de Jorge Juan on one side with views across the 640m² private landscaped garden on the other. The best quality materials and appliances have been used throughout, from the flooring, bathrooms and kitchen appliances to the personalised home automation to help maintain optimal conditions for both comfort and energy efficiency. 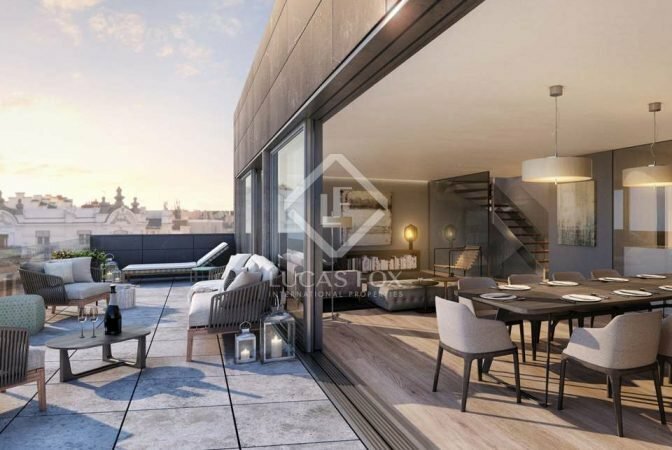 This 388m² duplex penthouse is situated on the 7th and 8th floors of a brand New Development on Paseo de la Castellana. Filled with natural light, it offers combines classic elements combined and a contemporary style. With two separate entrances on the ground floor, it consists of a bright spacious living room, a dining room, library, kitchen, study, guest WC and corridor that leads to the four bedrooms in the night area, all of them with private bathroom and dressing room. On the top floor there is a small landing that leads to a large 45m² terrace. To the right of the landing there is a living room connected to the study and with access to the master bedroom, with private bathroom and two dressing rooms. On the top floor is also an office with access to a 22.47 m² terrrace. The duplex has been finished to the highest standards with top brands including a Poggenpohl kitchen equipped with high-end Neff appliances and Hansgrohe taps. It also comes with LED lighting, solar control blinds and anti-intrusion security system. The building also has parking facilities.